In order for your video to automatically play when a QR code is scanned, your video will need to be a YouTube video. YouTube offers a free video hosting and free accounts. Simply create an account and upload you video to YouTube. Once your video has been uploaded, you will need to grab the share link for the video. Simply open the video you would like to automatically play and click on “Share”. A box will pop up with a URL, copy this URL and save it for the next step. For the next step, you will need to use a QR code generator. There are many QR code generators out there, however, our favorite is GoQR.me, a completely free QR code generator. Once you have loaded up your QR code generator of choice, switch to the URL type and put in your YouTube video URL that you copied above. Before you move on, it is time to pull out your mobile phone and scan your QR code to test it. Make sure the correct video does open up with you have scanned the code. Make any adjustments needed to your URL if the QR code does not open up your video in the YouTube app when scanned. Now that you have tested your QR code and everything works, you will need to download it. Simply hit the download button and an options box will open. In this box, you will be able to adjust colors, sizes, error correction codes and more. Our suggestion is to keep all options at default and bump the size up to 1000px. Finally, you will need to download your QR code. If using for print, SVG or EPS will provide you with a vectorized version that your print company can use for any print materials. If you are using the QR code on the web, download a PNG or JPEG version. All that is left is to promote your video using a QR code. This QR code can be used on flyers, business cards, signage, trade show banners and more. Let us know in the comments below if you have any questions or great ways that you use your QR code to promote your video. This open a YouTube video in my browser but not in the YouTube app. There are many platforms online which can create QR codes from any type of links. it can make people get to the video. but, direct link shared are more used than QR code because of instant link takes you to the app. Thank you datadrivenlabs for sharing this article. Before watching I din not know the name for a QR scan but needed one for my business. The best “How To” video I have ever seen. Excellent presentation and easy to understand. Thank You. Thank you so much, Chris. This is awesome. I had this idea to give somebody a voucher for a photo shoot as a birthday gift and wanted to “package” it in a video and then just wrap the QR code. I thought this would take me hours of research on how to do this. First site I hit on Google was yours and it’s taken me all of 5 minutes to generate a QR code. Brilliant! 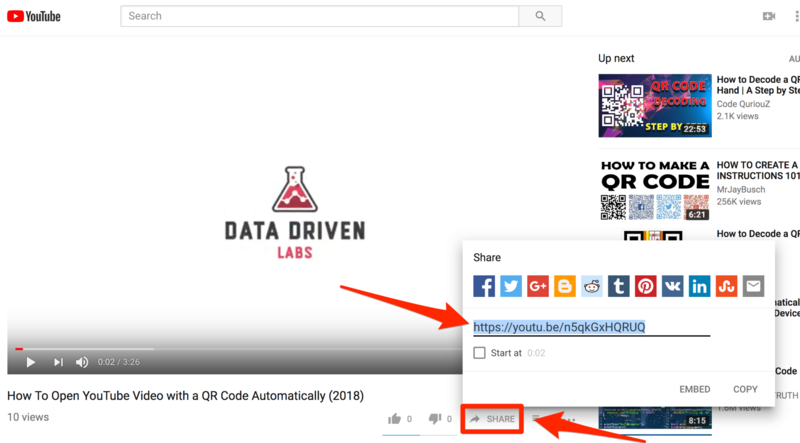 Is there a way to tag the YouTube URL in the QR code with information about the source (similar to the Google Campaign URL builder – https://ga-dev-tools.appspot.com/campaign-url-builder/)? We are generating QR codes for print ads in a variety of publications and we want to be able to determine the source of each QR code scanned. Yes, you can add UTMs to the YouTube URL. Just test it before you print to make sure all of them work correctly. Hi , I use the QR code on a business card of my band to link to a video on YouTube. It works! But I want to make the video a little bit brighter (it’s too dark..). Can I edit the video on YouTube without creatief a new url? YouTube has some editing tools. You can see if one of them is to brighten the video. Okay. But will this editing change the url? It shouldn’t if you are using the YouTube editor. THANK YOU! This video was a lifesaver… I made my first QR code like a pro! I’m going to have THE BEST Christmas cards EVER!!!! QR code Christmas Cards is a great idea! Chris, does it work in Android-based devices? Hi , Thanks for great tutorial. for me the title of the tutorial was misleading , I was looking for something that will auto scan the QR Youtube link and show the movie right after scanning. right now you scan the code , see the URL and only after pressing “browse” or “view” you see the movie or link – is there any way to bypass this extra step ? What type of phone are you using? The video auto plays on the iPhone if the YouTube app is installed.